Set in the village of Kroboland, Ghana, this film tells the story ofthree women: Adobea, Buki, and Theresa. Despite their different walks of life and individual struggles, they are united by the pain of losing a child. Buki is a doctor who plans to transform an abandoned house that villagers claim to be haunted into a clinic. Buki encounters Adobea, a childhood friend who is pregnant and unaware of an illness that causes her to cough up blood. Adobea’s husband’s family claims that she is cursed after several of her children die under mysterious circumstances. Buki and her husband seek counseling to address their marital problems largely created by their childless relationship. Their marital counselor, Theresa, struggled with drug addiction and post-partum depression twelve years ago that resulted in her husband taking their child away; Theresa works with a case investigator with the hope of reuniting with the daughter she hasn’t seen in years. A drama that weaves mysticism and supernatural elements into its storyline, these women develop a bond and learn from their collective experiences of redemption, love, and forgiveness as they restore the house into a clinic for the villagers. 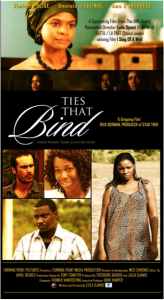 “Leila’s Ties That Bind Making News.” The Ghanaian Chronicle. 10 June 2011: Print.